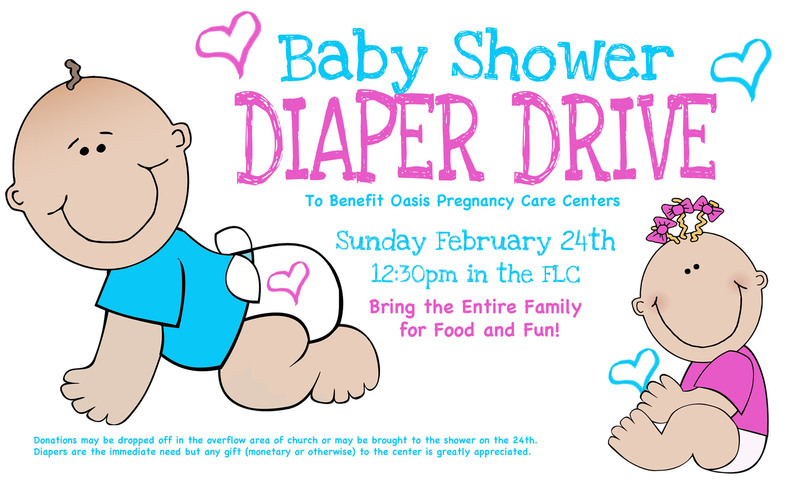 Wesley Church will be hosting a Baby Shower/Diaper drive Sunday, February 24th at 12:30pm in the the Family Life Center. The entire family is invited to attend this fun event! Please bring a pack of diapers and a dish to share. All donations will benefit Oasis Pregnancy Care Centers. Oasis Pregnancy Care Centers is a non‐denominational, Christian, faith‐based, non‐profit ministry group of people who offer encouragement and support to all women and families experiencing an unplanned pregnancy, planned parenthood or other life‐changing situations, regardless of faith or background. Visit the Oasis Pregnancy Care Centers website to learn more. If you would like more information on the shower or Oasis, contact Lesley Holroyd 813-361-7225 or Lholroyd@nfmlending.com.